Global credit card giant Visa is planning to open a new innovation center in South Korea as it seeks to expand partnerships with local financial technology startups to develop the next generation of payment solutions. “Korea is considered an epicenter of fintech innovation. 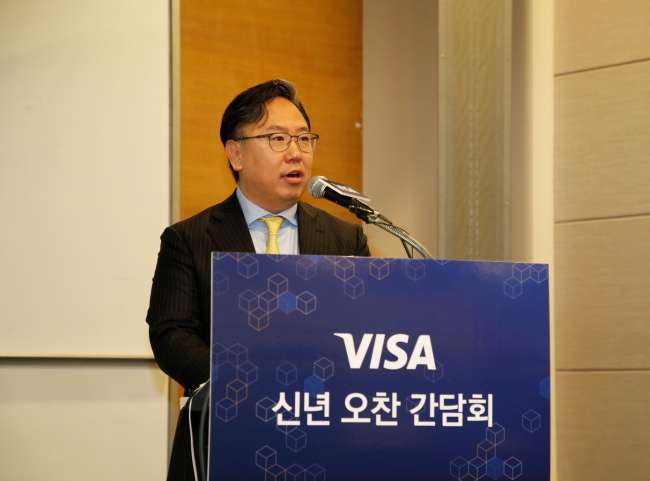 To pursue a more meaningful fintech-big tech collaborative business model, we are planning to establish an innovation center here,” said Patrick Yoon, country manager for Visa International Asia Pacific Korea, during a press conference in Seoul on Wednesday. “We have yet to decide where and when this center will be created. But we can confirm that preparations for a new innovation center are in the works,” Yoon said. The center is likely to open by year-end, according to the credit card company. Visa currently runs seven global innovation centers around the world, including in San Francisco and Singapore. They are collaborative spaces where Visa works with financial institutions, clients and other partners to co-create next-generation payment solutions. In bringing next-generation technologies to its products, Visa had initially worked only with big tech firms including Google, Apple and Samsung. But now it is actively seeking partnerships with fintech firms in different countries and running innovation centers to serve as base camps for such activities, according to Yoon. In line with this strategy, on Wednesday the credit card giant introduced the Visa Everywhere Initiative competition in Korea. Soon Visa plans to announce two problems it hopes to solve and will invite interested startups to come up with solutions in the form of viable business models. The winning startup will be selected in May and will receive a cash reward as well as specialized consulting and support from Visa to take its products to global markets, according to Visa Korea. Looking ahead, Visa plans to focus on key business areas that will drive the future payment market -- the Visa Token Service, the EMV Secure Remote Commerce specifications, the Visa Ready IoT program and the Visa Developers open application programming interface project. The Visa Token Service is a security technology that replaces sensitive account information, such as the unique 16-digit card account number, with a unique digital identifier called a token, which allows actual payments to be processed without exposing the user’s account details. EMV Secure Remote Commerce is a set of unified digital specifications that serves as a foundation for interoperable card payments across devices. The user’s credentials are saved digitally in the cloud so that when changes are made, they are synced uniformly across all the user’s devices. It’s a technology that will become increasingly important in the era of smart devices connected by IoT. The Visa Ready IoT program helps bring Visa’s high-security token payment system to IoT devices. The credit card company has also open-sourced its API for use by developers wishing to build Visa-compatible payment products.